Being on the Cultural Trail in Downtown Indianapolis along Mass Ave is GREAT! We are constantly entertaining cyclists on century rides, runners training for the Indianapolis Mini-Marathon, and babies in strollers who prefer to be pushed along the brick path laid by the city of Indianapolis. 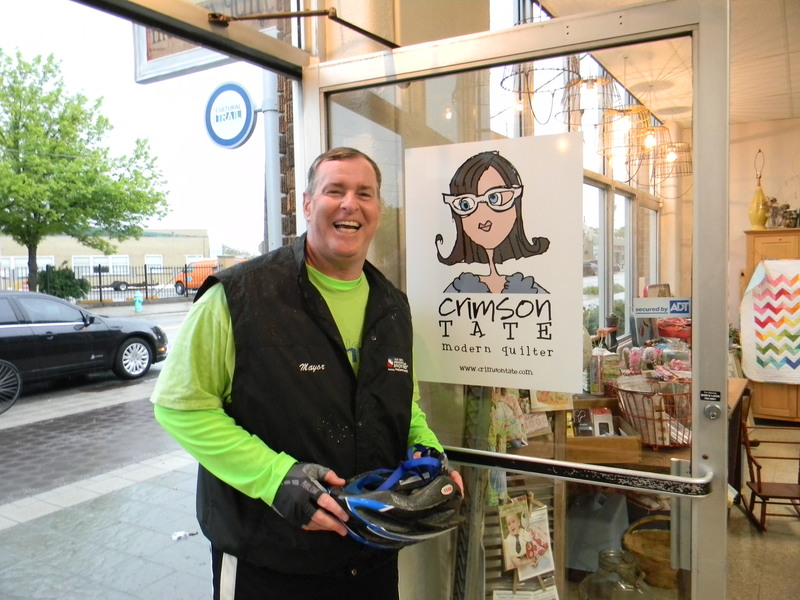 On Saturday morning during Camp Sew and Sew, Crimson Tate’s sewing club for kids, we spotted Mayor Greg Ballard as he hopped on his bike to take the Cultural Trail north to the Monon. From the 800 block of Mass Ave, it’s a simple jaunt to 10th Street and away you go. Thanks Mayor Ballard for entertaining us by posing with Crimson Tate’s sign after your bike ride. He looks good, don’t you think, considering he had just returned from a long bike ride along the best Cultural District in the city, Mass Ave. Perhaps his next adventure, a quilting class at Crimson Tate?!? Come on in!!! Yuwa Japanese fabric is found Downtown & Liberty of London is crossing the big pond! !